Nothing too exciting going on here today, so here's another photo from the archives. 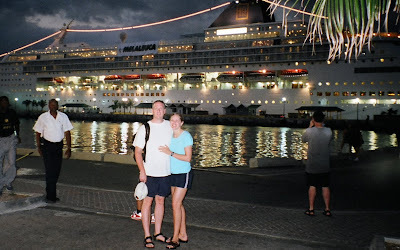 This was taken March 21, 2002, on our first cruise. 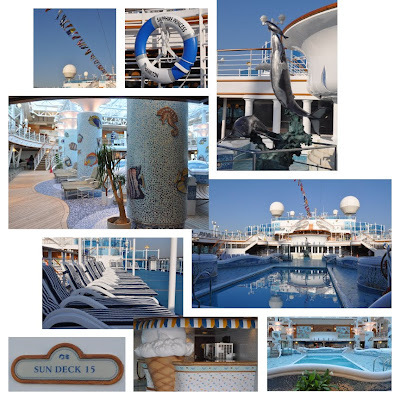 And I have posted more from our recent cruise, backdated because my OCD brain likes it on the day it took place, not the day I've finally gotten around to posting it. 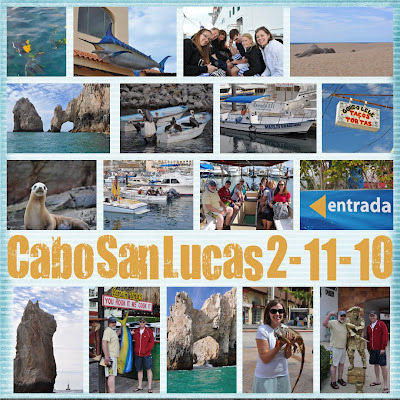 One of these days I'm going to finish sorting through the hundred-plus photos I took in Cabo and write about it, but people around here seem to think they need to eat and have clean clothes to wear. I woke up this morning with a stuffy, achy head and almost cancelled my plans to snowshoe with a friend. I'm so glad I didn't! Blue skies, fresh air and a little exercise are better than crack. Okay, I can't speak to that personally, but I've never heard of anyone overdosing on the great outdoors. :) Thanks for slowing down for me, Julie! Here's hoping that the Easter Bunny brings a new pair of snowshoes my way. She's looking so much older. She's gotten so tall, and she's lost the curls and the chubby cheeks. But she's still got mischief in her eyes, and the energy to pull it off. She still calls me Mama sometimes instead of Mom. Lately she's been giving me lots of hugs and kisses, and telling me how much she loves me. This morning I had the fan in the bathroom on, and she turned it off, saying "I hate that noisy thing. I like peace and calm and quiet, awesome Mom. I almost said stupid Mom, but that wouldn't be very nice, so I said awesome Mom." Whatever you say, Chatterbox. I'm trying to be more positive, so instead of continuing to complain about my least favorite season, let me just say, I love summer. Let me count the ways...or maybe not, that could take a while. But I keep looking at some of my favorite summer photos. I just don't feel like taking one more indoor or drab gray outdoor shot. Duffy was over here playing with Ainsley yesterday, and I was a little shocked to see how young they look in this shot, taken on the 4th of July 2007. Wish I had taken a photo of them yesterday to compare (we'll have to do that for sure this July 4th). Homework. I am so sick of it. But I'm too tired to get really worked up. That's all. To infinity and beyond. ILYTM. Tonight I made The Pioneer Woman's Spaghetti and Meatballs for dinner, and it was fabulous. And I'm an Italian food snob. Rob said they were the best meatballs he's tasted in his life. He's hoping for meatball sandwiches tomorrow. FYI, if you decide to try them, I used 1 lb. of mild Italian sausage, and 1 lb. of hot Italian sausage, no ground beef. Anyway, it would have made a great photo of the day, but they took a lot longer than I thought they would to make and we were running late for the Backman family history night, so I didn't take a photo. I did grab my camera before we left, but realized when we got there that it was out of batteries, so I'm posting a photo from the cruise for my daily photo. We were in Cabo, waiting out on the street for our tacos, and Kathleen picked up a Coke for Rob at the grocery store. Everybody knows that Mexican Coke is way better than American Coke, right? Right after she gave it to him, this truck started down the street. I whipped out my camera and took this shot as it passed by. Yes, the truck was moving. I couldn't have staged this any better. I'd like to credit my fabulous photography skills, but this was just pure serendipity. Bonnie Parkin was the speaker at our Stake Women's Conference this morning. The brunch was good, and it's always fun to have a chance to visit. There are several things I want to remember from her talk. She mentioned President Eyring's talk about recording the hand of the Lord in his life in his journal. I haven't done this in way too long. She said "it's pretty much impossible to be unhappy and grateful at the same time." I have found this to be true. All the more reason to recognize my blessings in writing. She talked about a friend who was dying of cancer and was racked with the feeling that she hadn't done enough. She was blessed with inspiration that all of the things we should be doing (callings, scriptures, temple, etc.) are gifts for our benefit, not something to make us feel guilty. She said we don't receive 70% of God's love for doing 70% of our visiting teaching. He just loves us. Period. I loved a story she told about her daugher-in-law's mother. She was in the same ward as President Kimball, and saw him wearing a new suit one week. She was a fabulous seamstress, and had some beautiful silk fabric, so she made a tie for him, and was on his doorstep to deliver it when she started doubting herself. But Sister Kimball answered the door before she could get away, and when this sister started to sort of apologetically offer her gift, Sister Kimball grabbed her by the shoulders and said "Susan, never suppress a generous thought." Love, love, love this. Definitely need to get better at it. 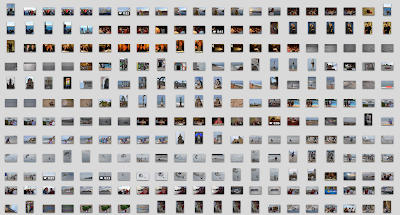 Rob's been on my case to get some cruise photos up, so I'm putting up an unprecedented 252 photos in one post. I'm hoping to backdate a few close up shots over the weekend. This is why I love the daily posting—it's just too overwhelming to pick my favorites from a field of 500. I think the half-pipe is my favorite event. Caught the women tonight, and have the men on DVR. Can't wait to see some serious air. For cold, coughs, strep throat, ear infections... Joey's had a nice long five-day weekend, stuck at home with a non-stop cough, ear infection, and possibly strep throat. We're up to six doctor's visits in 12 days. Robbie and Ainsley got checked the day before we left, see that post here. Then, while taking antibiotics for his strep throat, Robbie managed to get an ear infection, so Lupita had to take him in again while we were gone (thanks again!!). Yesterday I took Joey in and he did have an ear infection, and his throat looked like strep. He did pass the quick strep test, but we haven't heard back on the culture. Not that it matters much, he got antibiotics for the ear infection. Since Ainsley had a well-visit scheduled for today, they worked her in while we were there, and she got several shots. To top it all off, I took myself in with a sore throat today and am now also on antibiotics. Hopefully my quarantine will result in some time to go through my cruise photos and get some posted. Another upside: While taking this shot of Joey, with our assorted medications in the background, I learned the secret of getting him to smile. I didn't want him to look too happy to be home sick, so I told him not to smile. And voilà, he couldn't stop smiling. I meant to take my camera to book group tonight, but barely managed to remember the food I was bringing, so here's the after book group shot. Our book this month was Remembering Isaac by a local author/potter, Ben Behunin. My review is here. Like I said, it's not great writing, but it was a really great meeting. The author came and told us how he came to write these books, and it was a super-fascinating and inspiring story. If it were my story I'd be posting it here. If you have a book group, I highly recommend inviting Ben to come and tell his story. Even if you don't love the book, you'll love this. He brought some of his pottery, and I bought a small bowl. I love book group, and as usual, stayed up way past my bedtime talking to good friends there, which is why this didn't get posted until now. 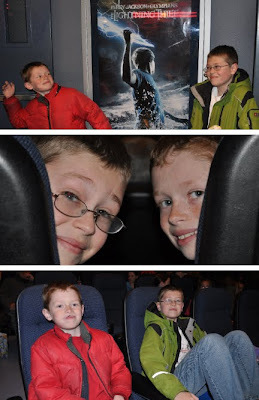 Robbie was so excited when he first saw that The Lightning Thief was being made into a movie. I liked this series too, and told Joey that he could go see it with us if he finished the book. So he zipped through the first couple of books while we were gone and the three of us had a date this afternoon. Three thumbs up. 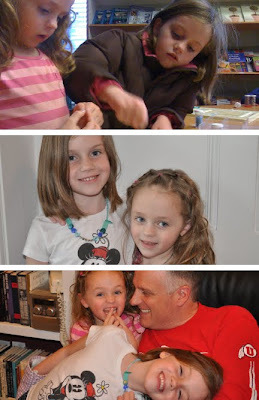 Meanwhile, Rob and the girls had a daddy-daughter date. They went and made necklaces, and then to Top-It for frozen yogurt. Rob hates all the "Hallmark holidays." Evidence here. So a few years ago I decided we needed a tradition that would work for us. I remembered from my mission the "lover's day" celebrated in Catalan. It's St. George's Day, but I always heard it called the day of the book and rose. Here's the story on that. Roses are pretty and all, but give me a book any day. 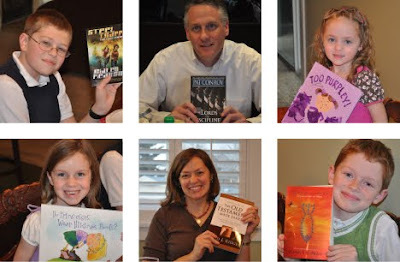 So that's our tradition—everyone gets a new book, all wrapped up and placed on their dinner plate. Our dinner is crepes with fresh strawberries and cream, because twice a year for conference breakfast is just not enough for those. This is now one of my favorite holidays, and you'll notice that even the photo/holiday scrooge is smiling. 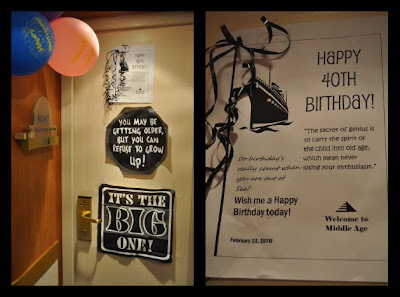 Sadly, my birthday was the day we had to get up early to disembark. Claudia and Kathleen decorated my door. We had one last breakfast together. And I discovered that this is a really good time to get photos without a lot of people in them. Saying goodbye...hopefully until next time. We had one final day at sea, and I didn't take many photos. Here's our final round of cruise trivia, which was fun, even though we never came in first place, so we missed out on the prize lanyards. It's hard to go up against groups who are on the same cruise for the fourth week in a row. And even harder when the cruise directors have the wrong answers. For the record, a group of whales is a POD, not an ORC. And Michael Jackson's longest running hit was Thriller, not I'll Be There. We're not still bitter about it or anything. Cabo was our favorite port by far. 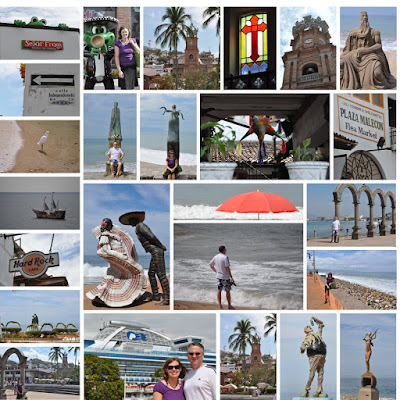 It's much smaller than Puerto Vallarta or Mazatlan, but cleaner, and so beautiful. We had the best tacos at this place. It was formal night back on the ship, and Kent and I had our birthday celebration. Our waiter, Ruiz, was awesome. 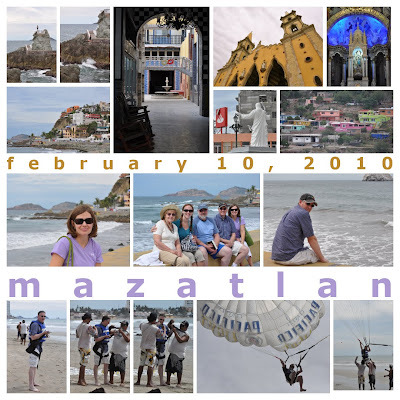 In Mazatlan we hired a van for all twelve of us, and while those in the front of the van listened to the driver's spiel about the different sites we passed, the back two rows had a slug bug war. We shopped for jewelry, toured the cathedral and went to the market to buy vanilla. I managed to make it through all the raw meat without hurling. Then we headed to the beach so Kathleen, Autumn and Aaron could go parasailing. After watching all three of them go up and come back down safely, Rob decided to give it a try too, despite his fear of heights. Video was hard to shoot, with the glare of the sun, but here it is anyway. He survived, and had a good time. Here's a shot of the whales hiding because Rob called me out to see them. I love the light on the water though. I did get a few whale photos. Although it's pretty overcast, I think this was my best shot. If you click on the photo you can see it better. And other than that, apparently I decided not to drag my camera around all day. I know we went to an afternoon movie (The Invention of Lying) and a stand up comic after dinner (Carlos Oscar). I think this is also the night we made the mistake of trying one of the production shows, "The Piano Man." Mediocre dancers and vocalists butchering the music of Billy Joel, Elton John, etc. We had to go play a round of racehorse canasta just to try and forget it. Unfortunately my parent kicked our butts, so that didn't really help. We paid them back in the airport on our way home. Rob spent a lot of time out on our balcony, reading and spotting whales. He must have seen at least twenty in one week. It was Superbowl Sunday, so we went down to one of the bars to save a spot and play cards. If there had been something really cool in the first play, like a return for a touchdown, I might have stayed to watch the game. No such luck, so I just took a photo of the true fans and went back to our room for a nap. It was formal night for dinner and they have tons of photographers with fake backgrounds taking lame posed portraits. This Iranian photographer got totally mad at Kathleen because we asked her to take photos with our camera at the same time. They looked like bad prom shots anyway, so we just had her take this one. You'll have to imagine how happy this made photo scrooge. We switched our seating up for dinner—here is the all Ashton table. Except Claudia, who came over to the dark side with us. The dinners were amazing—three course gourmet feasts, plus dessert. Plus anything made by someone else just tastes better. It was a true vacation for me, not to have to plan, shop, prepare and clean up after meals. No laundry either. Well at least DURING the trip. It's been over a week since we've been home and I still haven't caught up.